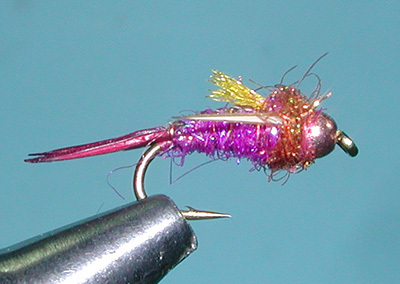 Notes: I posted this pattern within the Prince Nymph pattern as a variation many years ago. However, it has taken a life on it's own and deserves it's own page. 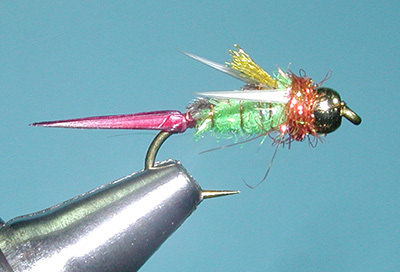 Since Mike Mercer introduced this pattern in 2011, it has become a popular attractor nymph primarily due to it's success in catching not only trout but steelhead, bass, and salmon. 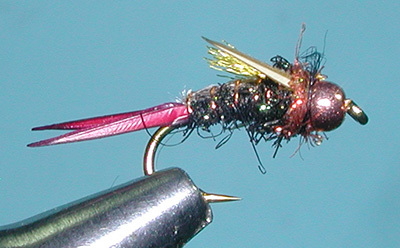 When Ice Dubbing was introduced by Hareline in the late 1990's, Mike experimented with the product as a triggering material for his series of Trigger Nymphs. The ice dubbing mimiced an expanding wingbud about to burst open. 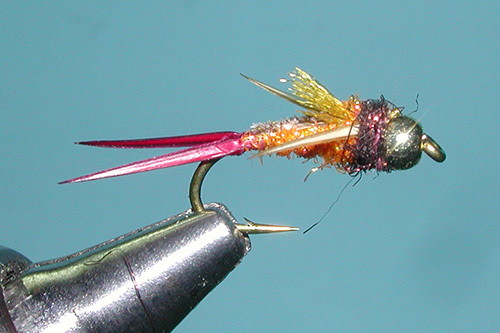 Since the Prince Nymph had it's own sets of triggering mechanisms, ie the contrasting biots for the wings and tails, Mike wanted to create a variation of the prince nymph using the ice dubbing as a body and collar. The initial patterns were ineffective as the bodies had too much flash to them. Mike added a shellback of Turkey Tail to hide about 40 to 50% of the dubbing. Not only did this reduce the flash of the pattern but it also gave the pattern the contrast between the darker dorsal portion of the body and a lighter underbelly. 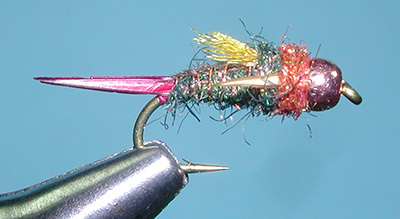 The original Prince Nymph also had a tinsel ribbing. Mike kept the ribbing but changed it to wire since the wire gave a good segmentation appearance to the dubbed body. 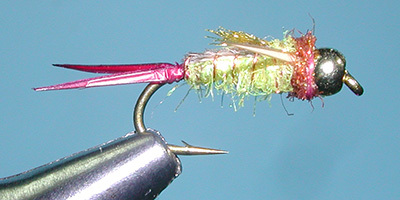 The Prince Nymph also has soft hackle for legs but Mike felt that the ice dubbing strands that extend from the collar would produce the same effect. 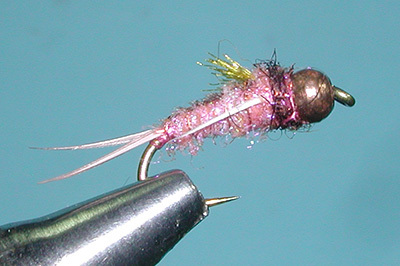 The small tuft of Fluoro Fiber represents the emerging wings, Mike also used Angel Hair and Lite Brite for material. Probably the most popular color for the Psycho Prince is Purple but the other colorations work as well and might be a better choice at a certain time and place. Beadheads are mandatory for the Psycho Prince. They provide a good weight source, particularly when additional leadwraps are applied behind the bead. 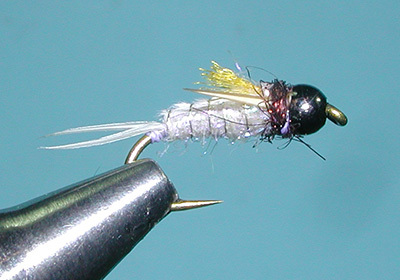 They also provide a very clean appearance to the head when all of the thorax materials such as the wing buds, wings, and shellback materials are tied in. The collar of Brown or Rusty Brown Ice Dubbing hides these tie-in wraps and the bead provides a good means to tuck those final whip finish wraps behind it. The beads are usually Gold but Copper is often used as well. Bead suggestions: 7/64" for size 12, 3/32" for size 14-16, and 5/64" for size 18.